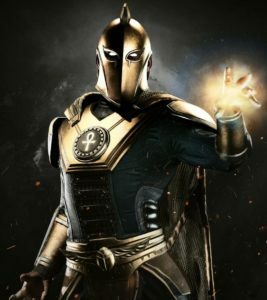 This page contains a character guide for Doctor Fate in Injustice 2. Here you’ll find movelists, combos, juggles and strategy guides and recommended gear for the Hero character. For more Injustice 2 content, head over to our Injustice 2 top page. Kent Nelson is a powerful sorcerer and agent for The Lords of Order who fight along side his wife, Inza. His Amulet, Cloak and Helmet of Fate are creations of the ancient Nabu, who acts as his mentor and spiritual guide. He is a founding member of the Justice Society Of America. Meter Burn R2 (must press R2 at the beginning of Amon Ra Blast). Sharidum’s Lock will lock close Environmental Interactions from being used by the opponent for a short period of time. Meter Burn R2 (must press R2 at the beginning of Sharidum’s Lock). Dark Magic augments the properties of Doctor Fate’s spells. Must have Dark Magic active to perform Glyph of Anubis. Nabu’s curse will do damage over time to the opponent if they are standing in the area of the curse. Must have Dark Magic active to perform Behind Nabu’s Curse. Must have Dark Magic active to perform Spell of Punishment. Final Punishment ↓→ x (must have Dark Magic active to perform Final Punishment). Final Punishment will drop 3 explosive traps. Below are combo and juggle inputs for the character, including corner strategies and restarts. He was included in an unofficial poll with other possible future DLC characters, he came second last. He was featured in Zatanna’s classic battle ending.